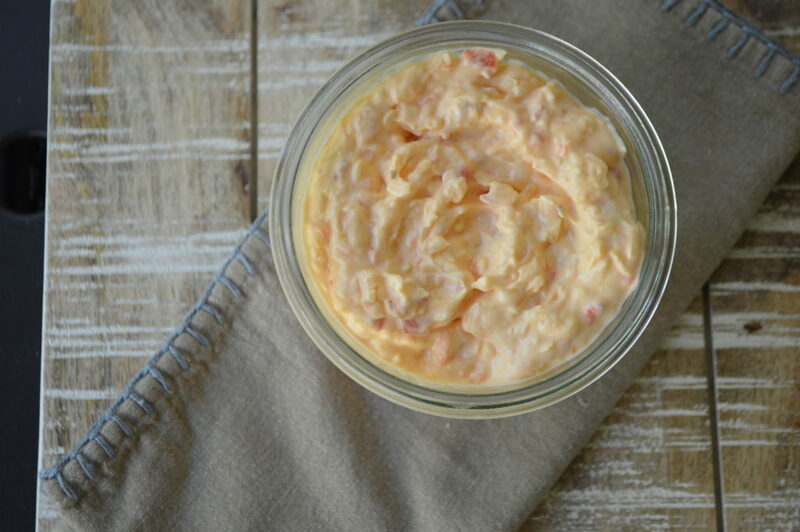 Pimento cheese is essentially a cheddar and cream cheese mixture with a few spices thrown in there and little bits of jarred pimento, which is just a sweet cherry pepper that has a very mild heat. It’s a southern classic and, having spent a few years of my life in the south, one that is nostalgic in the way only Virginia ham biscuits with butter can come close to. 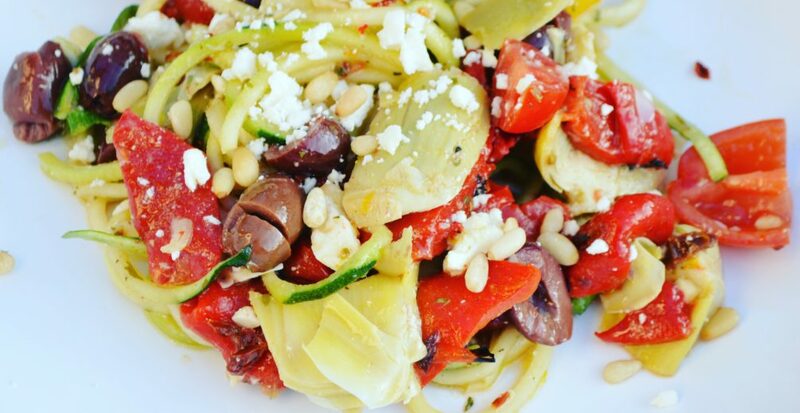 It’s so easy to make and it keeps well in the fridge. There are probably lots of great recipes out there for this spread but I added my own little twist with a kick from Serrano pepper as well. 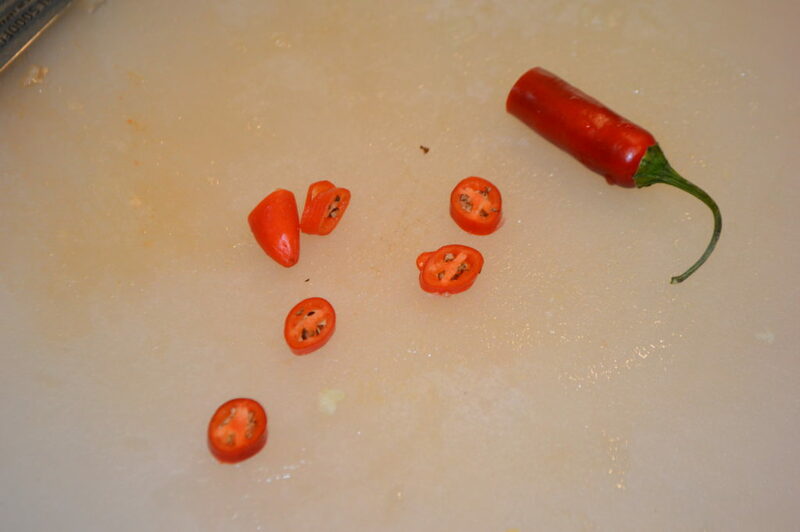 I like things a little spicy and I happened to have one so…why not. You can omit that to keep it on the non-spicy side. Also, I used freshly grated onion and fresh chopped garlic but if you are short on time you could always go for pantry items like garlic powder and onion powder. Nothing wrong with a few shortcuts. 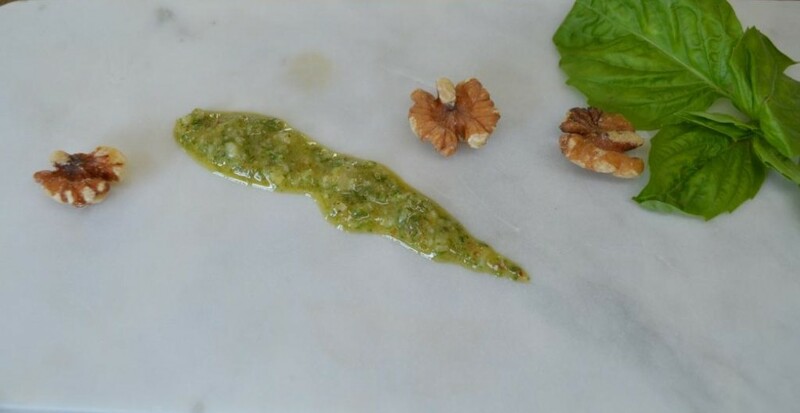 You can serve this alongside a veggie tray as a nice dip or use it on sandwiches. If you having a brunch or bridal shower you could make little finger sandwiches with pimento cheese and watercress, for example. Because I was having neither and just needed a good weeknight meal I decided to stuff some in some chicken breasts along with some fresh spinach and see what happens. The result was pretty good. Some of the cheese did start to ooze out while cooking the chicken but I’ve come to realize that those little things don’t matter. In the end the chicken was tender and moist and had really good flavor. The toothpicks were key though. You need to have something in place to keep the good stuff inside. For presentation I cut the chicken in half but it’s up to you. 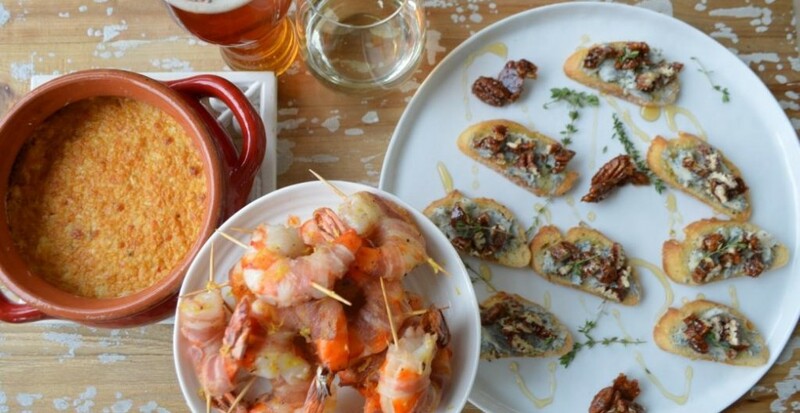 For a fancier presentation you could even do medallions and serve on a platter along with the jar of homemade pimento cheese so people can add more if they want (and so they know it’s homemade with love). Also, just a note on the cheese. 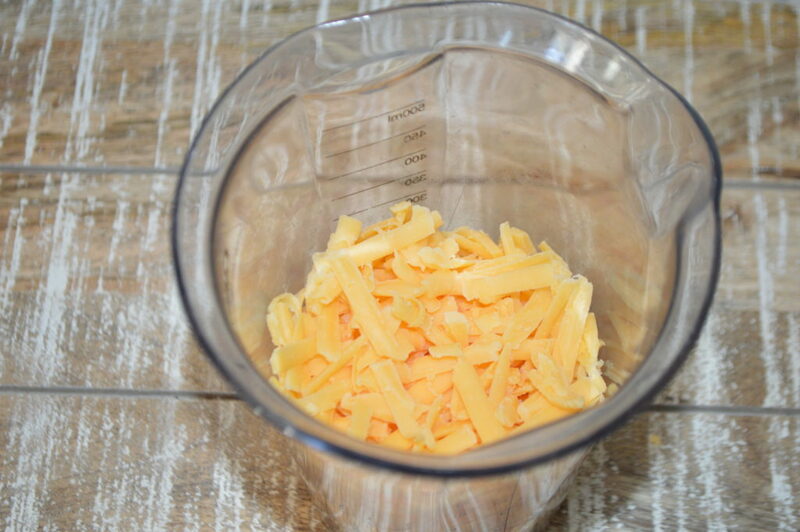 Use a good quality cheddar and grate it yourself. That’s the one part I wouldn’t take a shortcut on. 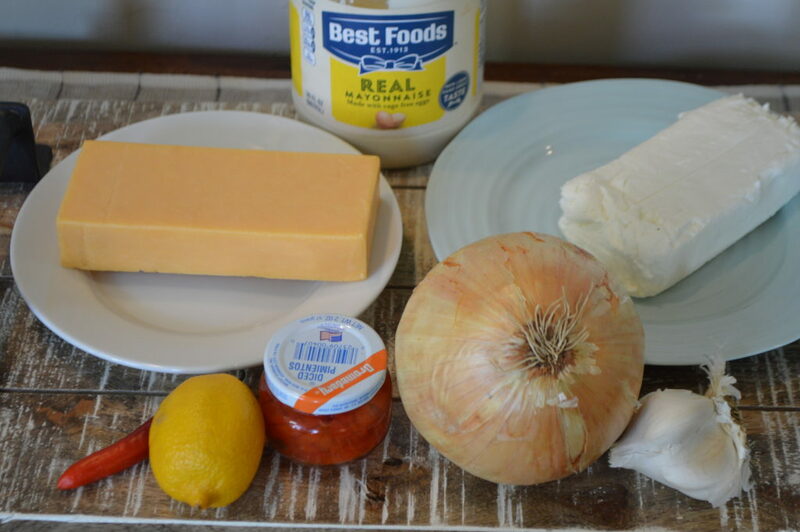 The bagged cheeses have stabilizers in them and you want the cheese to blend with the cream cheese and mayo to become one. 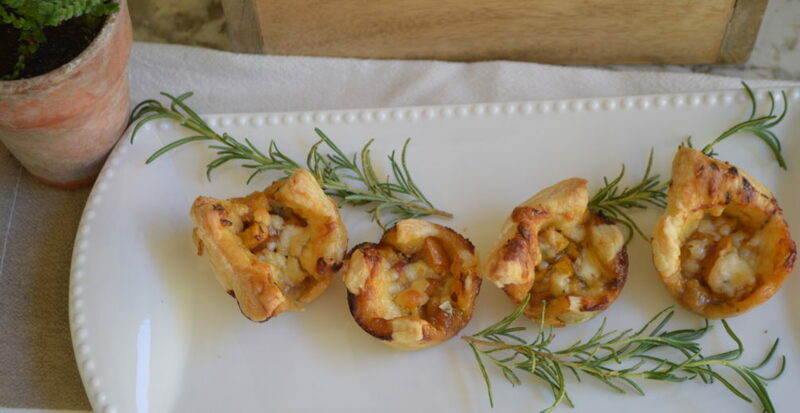 You can used an aged cheddar, a sharp cheddar, or a mild cheddar – whatever you like. 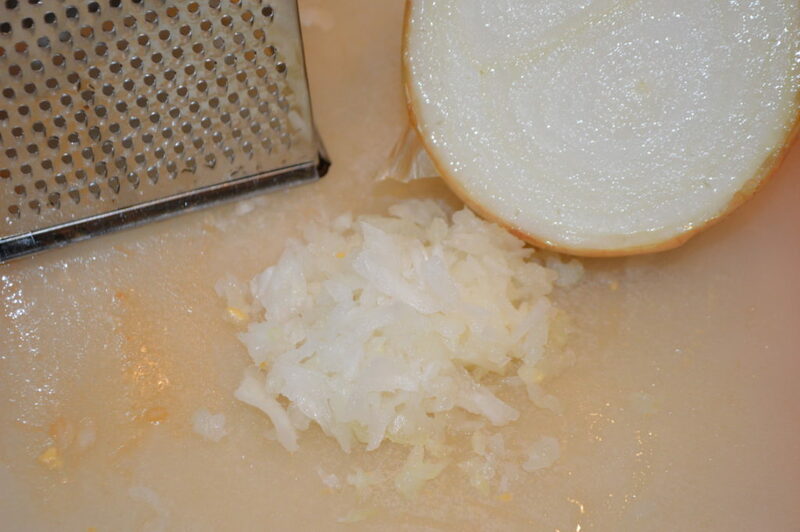 I used the big holes on the box grater to grate some onion but you could just used maybe 3/4 of a Tablespoon of onion powder instead if you wanted. 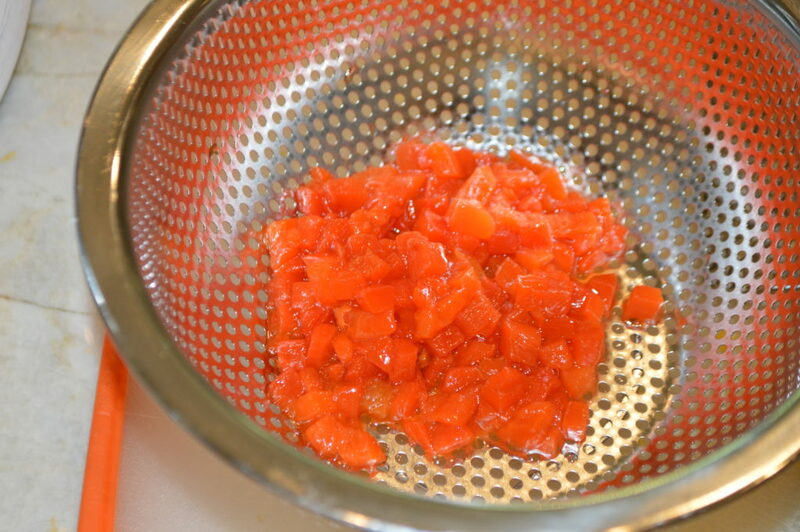 The fresh gives the mixture some moisture and I just like using fresh ingredients when I can. Add all the ingredients to the bowl of a standing mixer with a paddle attachment and mix on medium speed, increasing to a higher speed, until well blended. Place the yummy mixture in a jar and cover with a lid and refrigerate if not using right away. 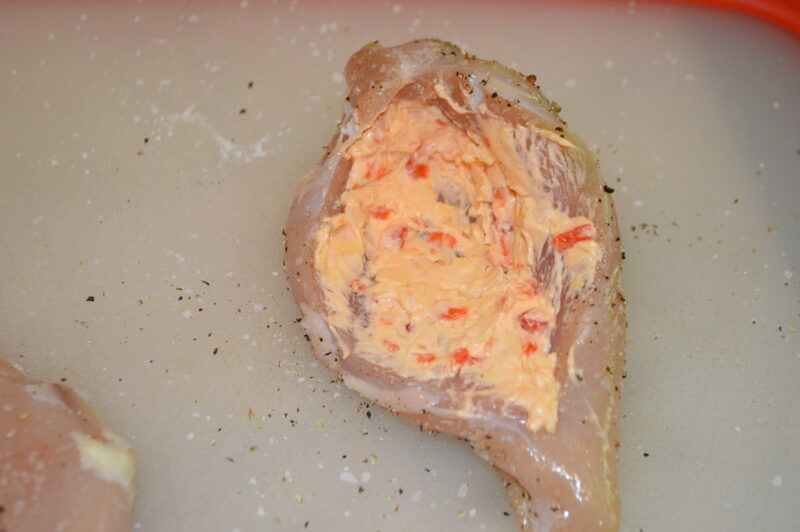 Take a few chicken breasts….I only needed two but had plenty of pimento cheese spread so could have done more if I needed. Carefully slice a pocket into the chicken. 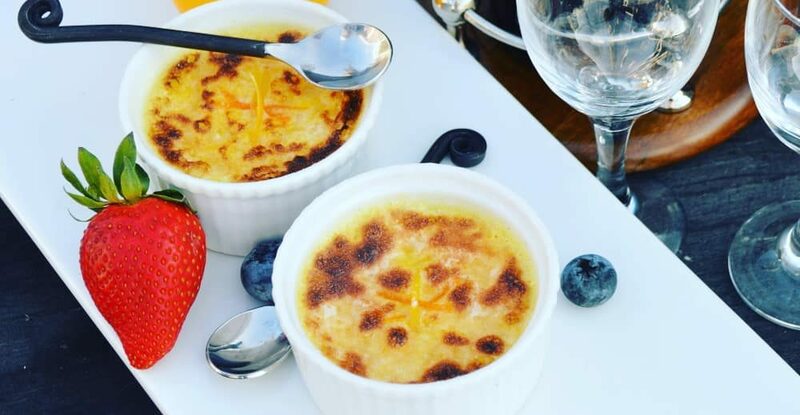 You want the pocket to be in the thicker part of the breast and not run too close to any of the sides or the filling will really just come right out. I used a very sharp knife and placed on hand on top of the chicken and then sliced into the thicker part very slowly. Season well with salt and pepper both inside and out. Slather a very generous amount of the cheese on both sides of the inside of the chicken breast. *Cooking note: Don’t contaminate the jar of pimento cheese spread by double dipping the knife. If you need more cheese use a fresh knife – raw chicken carries a chance for salmonella. Add fresh baby spinach on top of the cheese. 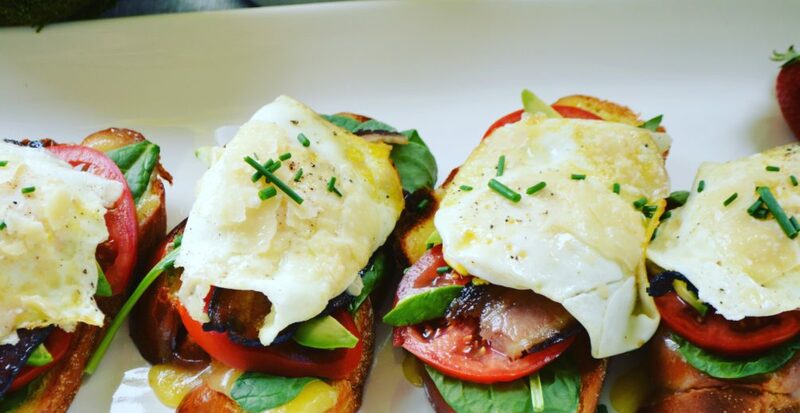 Really pack it in there because spinach wilts dramatically during cooking. 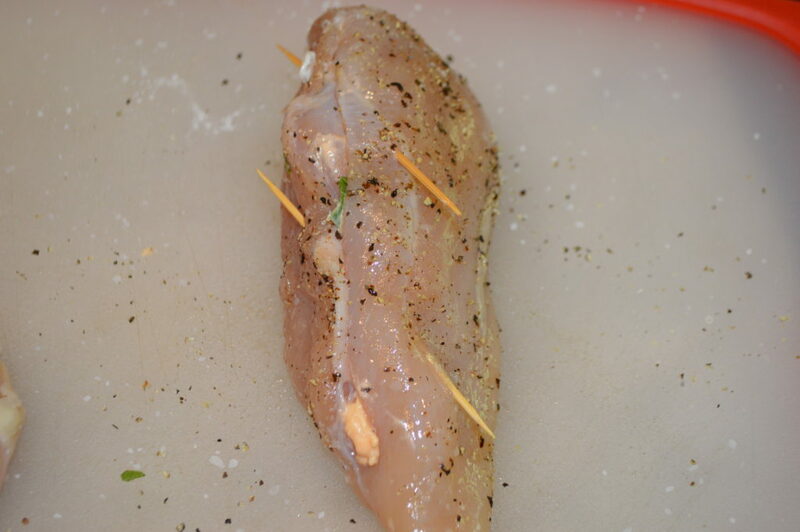 Secure with toothpicks on the thicker part of the chicken breast. Add some olive oil to a skillet and get the pan hot and then brown the chicken on all sides except the side with the open slit. Make sure to cook the chicken all the way through then remove from pan and remove the toothpicks. You can serve whole or slice. 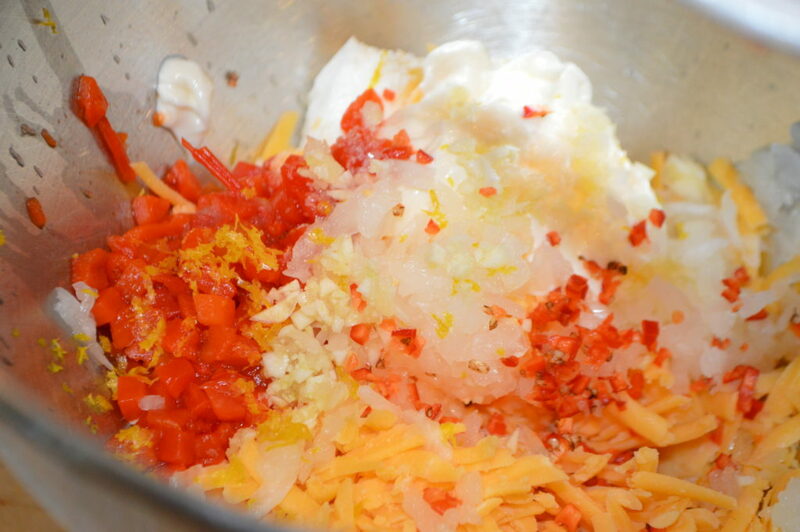 Add all the ingredients for the pimento cheese spread to the bowl of a standing mixer with a paddle attachment (or to a large bowl and mix with a wooden spoon or spatula). Mix well until combined. Cover and refrigerate. 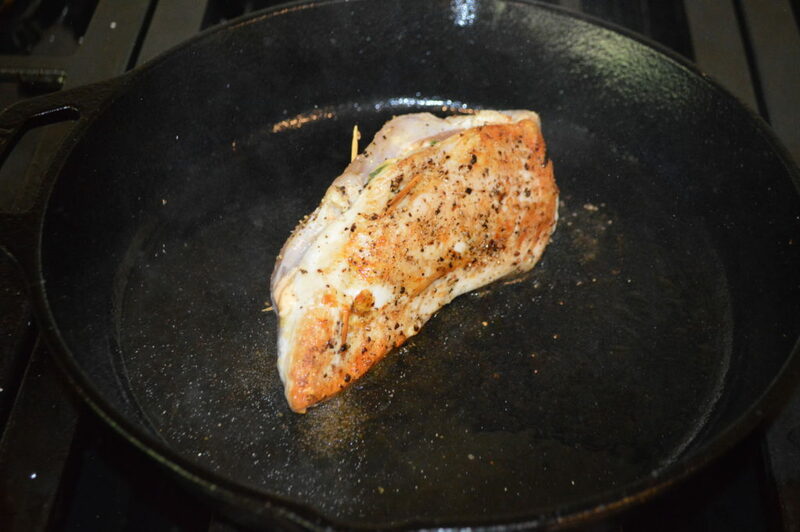 To make the stuffed chicken breasts slice pockets into the thicker side of the breasts (as shown above) and season well with salt and pepper. 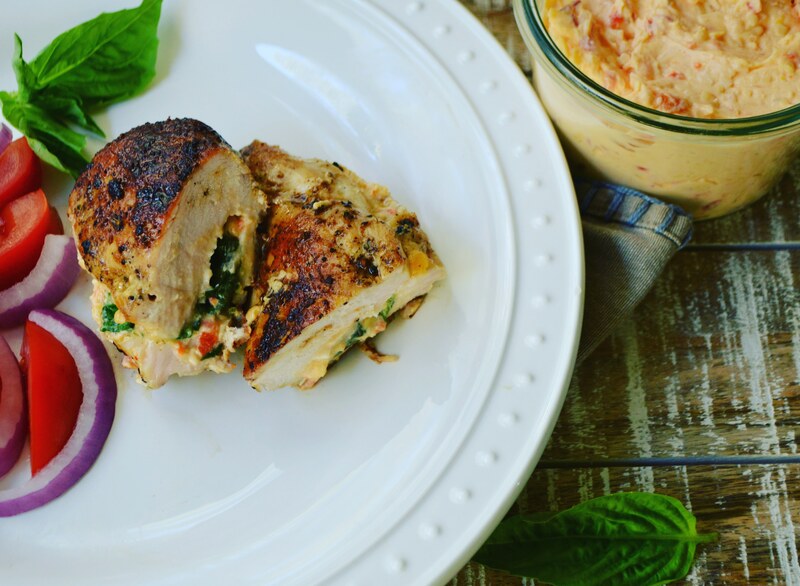 Slather a generous amount of pimento cheese onto both sides of the inside of the chicken. Add spinach and secure with toothpicks. Brown chicken in a hot skillet with a little olive oil. Brown on all sides, flipping and holding with the tongs as needed.